← Once upon a story ……. My layman’s belief is that before ancient humans came down from the trees they were primarily foragers (gatherers). They would have taken advantage of any scavenging opportunities that presented themselves and may – in isolated instances – have been driven to kill in defence, which subsequently provided a feeding opportunity. But they were primarily foragers rather than scavengers or hunters. Not so very different from the behaviour of primates today. A new paper from the Smithsonian adds weight to the belief that ancient humans were scavengers first and hunters only later. Scavenging, as a major means of getting food , could have been prevalent 2 – 3 million years ago. Abstract: For decades, the ‘hunting-scavenging debate’ has been an important research focus in Plio-Pleistocene hominin behavioral ecology. Here I present new data on potential scavenging opportunities from fresh carnivore kills on a conservancy in central Kenya. This ecosystem is dominated by felids (mainly lions) and has a different carnivore guild than in many earlier studies of scavenging opportunities that took place in areas such as Ngorongoro and Serengeti in Tanzania and Maasai Mara in Kenya, where lions face high levels of inter-specific competition from bone-crunching hyenas. I found that while scavenging opportunities vary among carcasses, most carcasses retained some scavengeable resources. Excluding within-bone resources, even the scavengeable meat on ‘defleshed’ larger sized prey carcasses is usually substantial enough to meet the total daily caloric requirements of at least one adult male Homo erectusindividual. I argue, as others have before me, that scavenging opportunities in a particular ecosystem will vary in part due to carnivore taxon, density and guild composition; prey size, biomass and community structure; and habitat (e.g., vegetation, physiography). We should expect variability in scavenging opportunities in different locales and should focus our research efforts on identifying which variables condition these differences in order to make our findings applicable to the diversity of ecological settings characterizing the past. 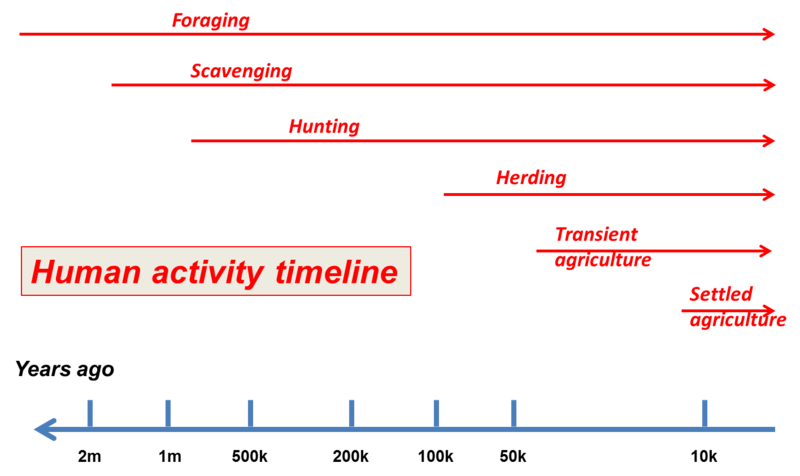 So the timeline I envisage for the development of human activity takes us from foraging to scavenging to hunting to herding to transient agriculture and finally to settled agriculture. The shift from scavenging to occasional hunting may be connected to the development of bipedalism, while active, organised hunting may be connected to the increasing control of fire. Certainly the ready availability of fire probably could have led to the feeling that all animals – no matter how large – could all be treated as prey. I have a picture in my mind of mammoth hunting taking off only because fire was available. Transient agriculture by peoples who led a predominantly nomadic life-style and where some plants and vegetables were intentionally cultivated during the few months of a summer camp may well have been established by about 40-50 thousand years ago. I take settled agriculture (and therefore the growth of cities) to have begun around 12,000 years ago. This entry was posted in Agriculture, AMH, Ancestors and tagged foraging, hunting, Scavenging. Bookmark the permalink. I’d guess that the idea of killing for food has been part of a foraging lifestyle already. It would be one tiny step after another, from eating an egg, a maggot, a grasshopper, a bird nestling and so on. Certainly none of these steps needs to be an actual revolution or very dramatic. Also, animals have not only been a source of food, but numerous other ressoures, as bones, tendon, hide, hair, feathers, horn, shells and whatnot. That could be scavenged from dead animals or living ones, I’m sure it would not really matter ro any early human. Imagine seashore dwellers gathering mussels. There’s no clear line anywhere. Stone tools and fire surely made a big difference then. My thoughts about scavenging to survive have historical basis. I’ve always figured that scavenging came before hunting. Seems like common sense. Although still quite risky, it certainly would require less effort. It would probably result in pretty good ROEI in most cases.